Sarah Miller explores the relationship between politics, art and policy in WA. Talking about state governments in terms of their artistic policies can seem like a contradiction in terms. Historically, their role has been the provision of ongoing infrastructure support for flagship institutions: state theatres, state operas, state ballets, state museums, state art galleries, state libraries and their regional equivalents. These are understood as the mechanisms through which mainstream Australia articulates its traditional (sic) values and aspirations. These activities receive dominant support (financial, political and media) as the constitutive identity process of the culture. The nature of these ongoing commitments may differ in degree and emphasis from state to state but, generally speaking, there is little left in the budget to support the activities of individuals, groups and organisations whose interests and concerns—stating the obvious—are rarely at one with the interests of government. Hence the emphasis in recent months on the structural changes taking place at the Australia Council—historically at least understood as the major provider of direct financial support to artists and contemporary practice in general and, perhaps most importantly, at arm’s length from the interests of government. In Western Australia however, separated from what are understood as the primary centres of power (Canberra, Sydney and Melbourne aka the Golden Triangle), the issues are perceived somewhat differently. It’s not uncommon, for instance, to hear the Australia Council referred to as the ‘NSW Council’, perpetuating a popular myth about financial benefits accruing to artists and groups living in NSW. Bitterness also attaches to the fact that so-called national institutions such as the Australian Opera and Ballet, resident in Sydney and Melbourne respectively, rarely (if ever) make their way across the Nullarbor despite the fact that WA tax dollars also support these institutions. West Australians tend to be cynical about the notion of national institutions generally, from which they perceive they derive little benefit. This rather begs the question of just who does benefit but more of that on another occasion. In Perth where around 97 per cent of the population of WA live, artists, groups and organisations take for granted a rather more direct relationship to their Parliamentarians and understand the Western Australian Department for the Arts (WA DFTA) as their primary source of funding (at least potentially), of information and of mediation. Funding occurs in two streams. On the one hand are those institutions—collectively known as the Arts Portfolio Authorities—directly funded by government through the minister’s office: the Library Information Services of WA (LISWA), the Western Australian Museum, the Art Gallery of WA, Screen West and the Perth Theatre Trust. It is perhaps worth mentioning in this context that the overall budget for arts and cultural activities in this state is around $59 million. Well over 50 per cent of these funds goes to the aforementioned institutions with LISWA picking up the lion’s share with core funding of more than $26 million. This leaves around $13 million to be distributed by the Arts Investment Division of the WA DFTA in support of various infrastructure needs, individual artist support and projects. Their brief is enormous, encompassing Community Arts, Music, Dance, Literature, Visual Arts and Craft and Theatre as well as—under one heading—Multi-Arts, Marketing & Youth Projects, Regional Arts, Aboriginal Arts, Touring, Conferences, Seminars & Special Events, Creative Fellowships, Arts Agencies Program Funding and ‘Other’. It is true to say that Western Australia provides more direct support for the Arts than any other State in Australia. State departments for the arts (DFTAs) are utterly dependent on their employer, the government of the day—in particular, the minister for the arts—and are bound to further that government’s interests. Unlike the Australia Council, a statutory body at arm’s length from government, a state DFTA must conform to the changing tides of political fortune. Peer committees are a courtesy and the minister for the arts has the right—albeit rarely exercised—to overturn any decision made by those peer assessment committees. It leads to a certain schizophrenia in both clients and staff, as staff seek to ensure the dictates of government are met while at the same time addressing the realities of the broader arts community. This slippery relationship, where the government purports to represent the needs of mainstream Western Australia, sits at odds with a frequently paternalistic and even punitive approach to artists and arts workers—never understood as bona fide—let alone to tax-paying members of the WA public. I do not consider arts funding a right, nor is it to subsidise an industry, nor to ensure employment of artists and arts workers. It is to enable arts activities and product to reach the people of WA. This message from the Minister (ironically) brings State Coalition Arts Policy into line with the rhetoric of a Federal Labor Government as demonstrated through Creative Nation and a restructured Australia Council. A similar discomfort might be discerned in the relationship between the State Coalition Government—headed up by the ultra conservative Richard Court and with more than the usual number of rampaging Baptists on board—and the Department for the Arts itself with their rather closer relationship to the real needs and concerns of the arts community. Economic rationalism, wholesome family values and good clean fun are all emphasised by the current government with a special emphasis on law and order. While Richard Court continues to grandstand on the evils of Native Title and the need to undo the Mabo legislation, the Coalition arts policy prioritises Aboriginal Arts as “the great lost opportunity in WA tourism”! It is up to the WA DFTA to find a way to turn this exploitative approach into a working and consensual reality for Aboriginal peoples working within and without traditional communities. The last 18 months have seen considerable changes at the WA DFTA, beginning, in 1994, with the introduction of a significant change in terminology. The State of Western Australia no longer funds or even grants financial assistance to individuals, companies or groups. Rather it ‘invests’ in a range of cultural activities and services. One well known arts identity in Perth has described this policy as the “open pit mining approach to arts funding”—investment as exploitation as opposed to sustainable development. Underpinning this change lie several well worn but idiotic assumptions: first that artists, companies and arts organisations exist as bloated parasites on the emaciated body of the hard-working tax payer; second that the most urgent cultural imperative this country faces is weaning artists and arts workers off the ‘iron lung’ of arts funding; and third that the arts generally takes food out of the mouths of starving babies, hospital beds away from the sick, and resources away from the disabled. In the future, artists (presumably assumed to be white, middle class and able bodied) will be not only self-supporting but make a profit as well. Further changes in 1995 came with the appointment of Dr Margaret Seares to the position of CEO at the DFTA. Seconded from the Music Department of the University of Western Australia, Dr Seares has already made her mark in the position, being seen as not only pragmatic but also even handed and accessible. Following the announcement of the 1995 Arts Investment decisions, the WA DFTA held a public meeting to explain the rationale behind the decisions and to announce its new priorities: Aboriginal Arts, Youth Arts, Country Touring and that new and nationally acclaimed artform area, Marketing. Given the uproar from the field, which generally did not feel increases to various flagships reflected these priorities, the DFTA acted quickly, initiating a series of working parties and strategies to address their concerns. A Youth Arts working party, a Research and Development Policy, strategies to support the development of artists working in multimedia and considerable rethinking on the proposed marketing consultancy, reflect a desire to engage with the arts community, an attitude somewhat at odds with that of government. Recognise the role of the Family. The family is and will continue to be the focus for this awakening of interest [in the arts]. Artists and arts administrators should always provide encouragement to arts development through families. However, even the most artistic family cannot supply all needs in this area and our education system has a responsibility to help give children a grounding in the arts. I am delighted to be able to say that the guidelines and policy are currently being rewritten. So whilst the language of economic (ir)rationalism predominates and the flagships continue to dominate the fiscal and political playing field, it has to be said that moves are afoot to address some of the more outrageous omissions and blind spots. Beyond which, if it is true that the people get the government they deserve, perhaps the same can be said of artists and arts policy. 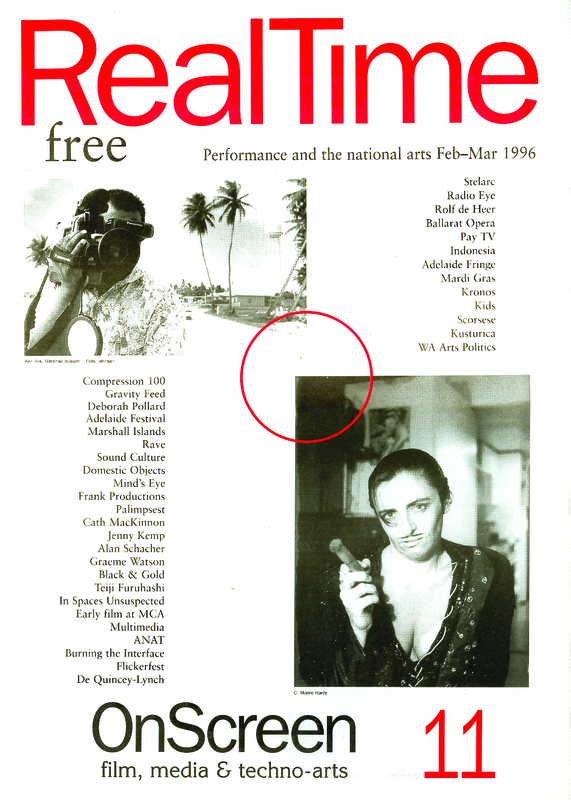 If artists and arts workers in WA are committed to change, we will all need to work hard at what Rachel Fensham (RT 8) has described as “the collective process of imagining … determining what is exciting or important to do now” which lies beyond vested and parochial interests or the presumed universalism of a colonialist aesthetic.